Stuart Eizenstat has worked in the White House under the Johnson Administration, the Carter Administration, the Clinton Administration, the Obama Administration, and the Trump Administration. Stuart’s expertise and experience granted him a variety of positions under these administrations including White House Staff aide (1967-1968); Chief White Domestic Policy Adviser (1971-1981); U.S. Ambassador to the European Union (1993-1996); Under Secretary of Commerce for International Trade (1996-1997); Under Secretary of State for Economic, Business, & Agricultural Affairs (1997-1999); Deputy Secretary of the Treasury (1999-2001); Special Representative of the President and Secretary of State on Holocaust-Era Issues (1993-2001); Special Adviser to Secretary of State Hillary Clinton and Secretary of State John Kerry on Holocaust-Eria Issues (2009-2017). Currently, Stuart serves as the Expert Adviser to the State Department on Holocaust-Era Issues. Stuart Eizenstat holds nine honorary doctorates degrees, over 75 awards, including high civilian awards from France (Legion of Honor), Germany, Austria, Belgium, Israel, and the United States. He is the author of Imperfect Justice (2003) and President Carter: The White House Years (2018). In addition, Stuart frequently writes op-ed articles on trade, political issues, foreign policy, and Holocaust-related issues (e.g., Nazi-confiscated art). Stuart’s articles have appeared in major newspapers including The New York Times, The Washington Post, The Financial Times, The LA Times, Wall Street Journal, The Hill, Politico, and more. Stuart Eizenstat has been interviewed on Fox Business News, MSNBC, CNN, and NPR on his newest book President Carter: The White House Years. Further, Stuart has taken his expertise to speak to large audiences around the United States and even in London to discuss President Carter. Some of his past audiences include private organizations such as the Council on Foreign Relations, Army-Navy Club, University Club, and Cosmos Club; universities and college campuses; synagogues, Think Tanks, and more. Stuart is an expert on trade, economic, foreign policy, political issues, and Holocaust justice related issues. Famous for the legal pads he took to every meeting, Stuart Eizenstat draws on more than 5,000 pages of notes and 350 interviews of all the major figures of the time, to write the comprehensive history of an underappreciated president—and to give an intimate view on how the presidency works. 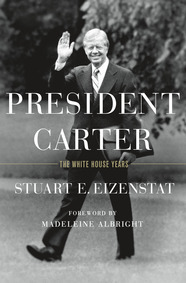 Read what The New York Times Book Review has to say about Stuart Eizenstat’s President Carter. Stuart Eizenstat sat down with Brookings to discuss President Carter and his experience working in the White House. The Washington Post reviews Stuart Eizenstat’s President Carter: The White House Years.